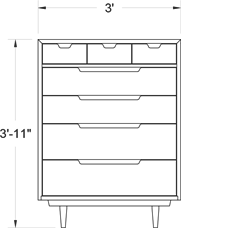 The chest of drawers-high is a bureau that offers a variety of drawer sizes. Shown here with bookmatched Western walnut boards continuous from side to top to side again. This piece is a compliment to the chest of drawers-low. Features include: hand-cut dovetails at case top with mitered front corners, waxed hardwood drawer guides, and turned legs. Custom modifications will be considered.